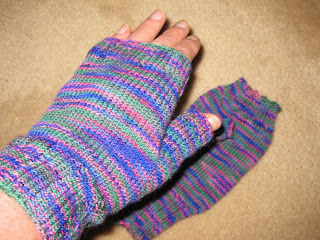 These fingerless mitts for my friend Sue made the trip home from Fargo, ND a real pleasure. Sue wanted a mitt with a longer thumb and shorter cuff. I like the longer thumb and will definitely be making a pair of these for myself. 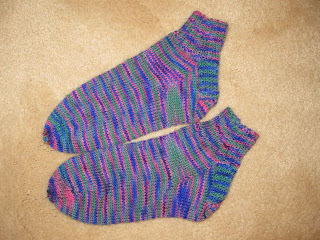 The remaining yarn made a pair of short-cuffed socks the perfect size for my sister. 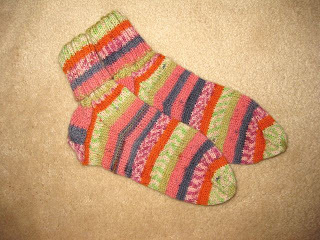 I used Cherry Tree Hill supersock yarn (100% superwash merino). It was my first time knitting with merino, and I am in love. This yarn did not split and slipped nicely on the needles. It has a heavier twist than other sock yarns and will wear very well. These wild-colored socks were gifted to my sister for her hospitality. The yarn (a superwash wool by Wisdom Yarns - San Diego) didn't look bad in the skein, but why the designer put such a loud orange in the mix is beyond me. Other than the colorway, working with the yarn was a delight, no splitting or dropped stitches. I finished the first sock just as we were pulling into Fargo, ND and the other one two days later after two nights of knitting while my sisters and their husbands played cards. Kids Just Want. 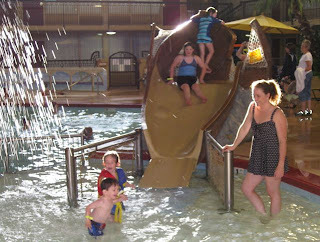 . .
My niece (in the black suit at right) watches over her children (my three-year old great-niece, Rose, and two-year old great-nephew, Jesse) while they burn off some energy. Preparing to descend the slide is another one of my great-nieces, Nicole, who is ten. I don't have the opportunity to see these children very much, so I spent as much time with them as I could while I was in Fargo, ND. We went to the carnival at the Red River Valley County Fair and played around their grandmother's house. So much energy is packed is such small bundles. The quilting and binding are finished on the Bear Paw Quilt. 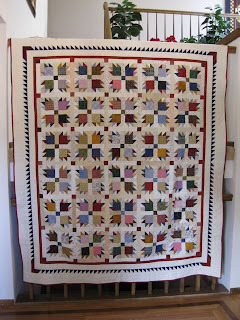 Cinnamon Jumble was quilted with honey bees. It is completely finished, too. 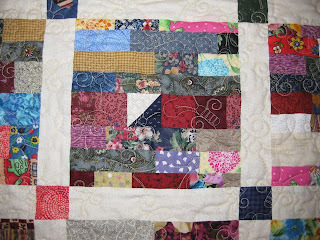 Cinnamon Jumble was donated to the Quilter's Newsletter drive for victims of the Japanese earthquake and tsunami. 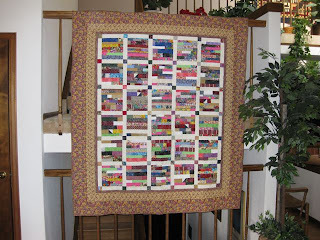 I pray that the recipient finds comfort in this quilt. It's hard to believe that I finished two quilts in six months. 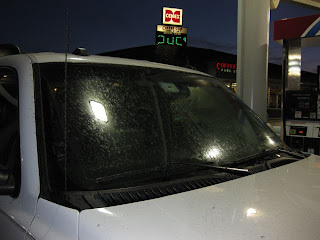 It was late when we neared Jamestown, ND last week, and it became obvious we were in a moist, humid environment. We had to exit and scrub the windshield a couple of times just to see the road. I have never seen so many bugs at one time. 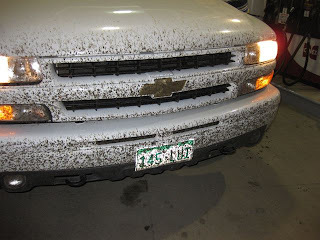 Even the doors and side mirrors were caked with bugs. It took two cycles at the car wash to get rid of the remains. I always wanted to knit some scrubbies out of mesh or netting, but I didn't have a pattern until I located this pattern, called Dish Cloth Duo. It is also available in a similar crochet version. 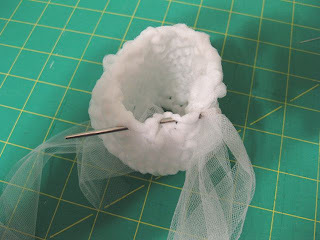 I found some tulle at the thrift shop and experimented before I purchased another roll for a road trip knitting project. 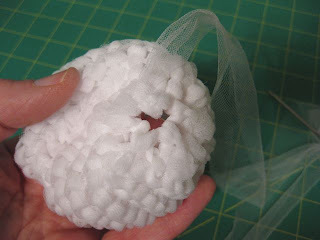 The 6-inch rolls of tulle can usually be found in the bridal aisle of Hobby Lobby, JoAnn's, etc. Try to find some without the shimmer or glitter because you will be paying extra without any real benefit. 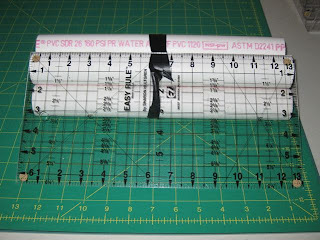 Pull the cardboard tube out of the middle of the roll and using some old scissors, cut the roll in half. You are now ready to begin knitting. I used size 11 bamboo needles because I did not want to scratch my metal needles. 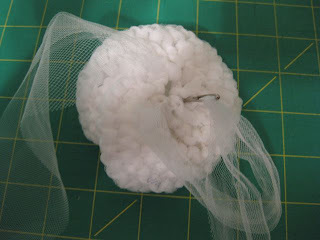 I discovered that each scrubby takes about 12 yards of 3-inch wide tulle. 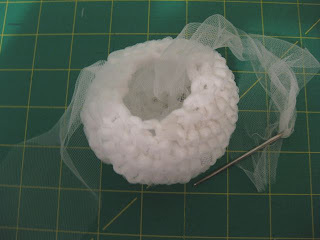 The rolls of tulle vary in length: the smallest roll I found had 25 yards of 6-inch tulle which provided 50 yards of tulle when cut in half, resulting in 4 scrubbies. When you finish knitting, your object will be this shape. 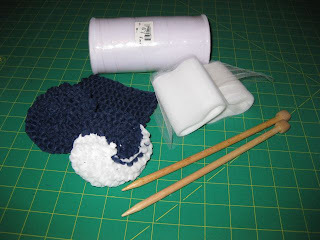 Leave a tail of about 8 inches so you can finish the scrubbie. Match the cast on edge with the bound off edge. Pin if necessary. The edges will snuggle up against one another forming a tube. 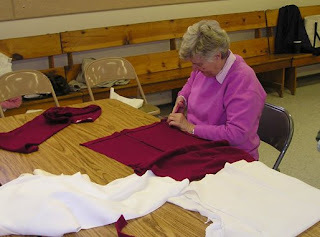 Using one of the tails, stitch the two edges together. Do not cut the tail. 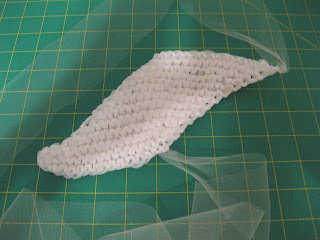 Use the tail to go through the slipped stitches. Pull the stitches so the tube closes tightly on this one end. If the tail is long enough to go through the stitches at the other end, then repeat the process. 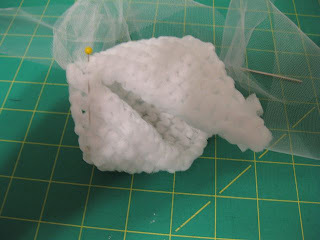 If not, secure the tail and use the other tail to gather the slipped stitches. Now flatten the scrubby so the gathered stitches are together. 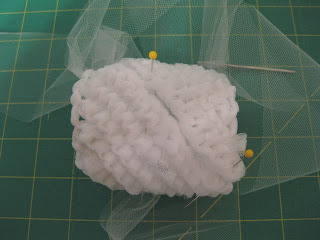 I secured the two sides together a few times to allow the scrubby to keep its shape. Being confined in a vehicle on the open road gave me a lot of time to work on scrubbies. 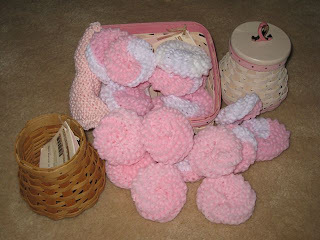 I completed 20 scrubbies for my sister's Longaberger Breast Cancer Walk. She will place the scrubbies in baskets ordered by her walkers. Two Fridays a month a group of ladies gather in the fellowship hall of my church. 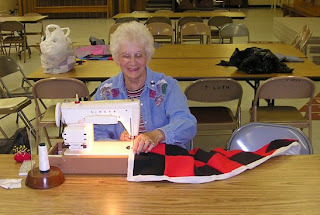 They are members of the Lutheran Women's Missionary League, and one of their missions is to provide serviceable quilts to those in need. 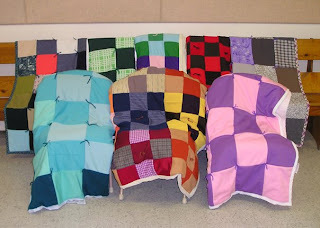 These quilts are made out of discarded polyester clothing and polyester yardage. Step One: cutting the squares. 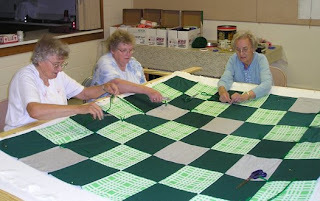 Several sizes of squares are made, so nearly all of the fabric is used. 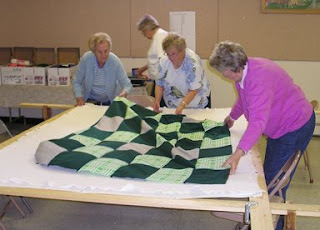 The squares are sent to the next station where they are organized and then selected for quilt tops. Step Four: prepare the quilt "sandwich" with the top, a used blanket for the batting, and a bed sheet for the backing. 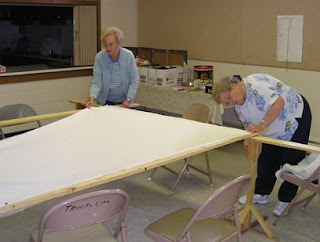 Step Three: tack the bed sheet or quilt backing to the frame. Step Four: place the batting (old blanket) and quilt top on the frame and secure with pins. Step Five: Tie the quilt with yarn to secure all three layers. Step Five: Send the tied quilt back to the sewing group where the excess backing is turned and now serves as the binding for the quilt. Mission Accomplished. 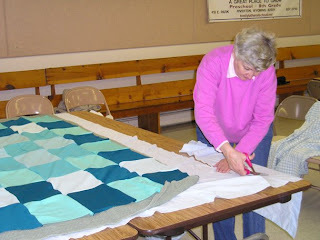 Materials have been saved from the landfill, and attractive and durable quilts are the result of this labor of love. 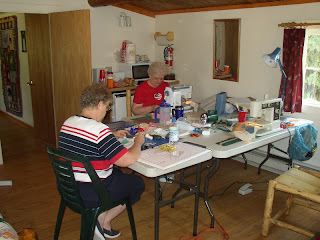 What can three sisters with two sewing machines create in one week in a semi-isolated, two-room cabin? Priceless memories of massive millers (moth) attacks and their ultimate slaughter (believe me it was memorable), reconnecting and remembering childhood memories, and . . .
three unique Sunbonnet Sue quilt tops made from our mother's hand-appliqued, Sunbonnet Sue blocks. I recommend going on a crafting retreat with your sister, your daughter, or your friend. Make sure you grab the camera at your next gathering and take a picture of the whole gang. Arrange for a non-family member to take the photos so everyone can be pictured. Photos like this are a wealth of information for future generations. Of course, don't forget to label the photo, so they know the identity of who was there. Can you find me and my two sisters in this photo? My two sisters married two brothers. This picture features both sides of the family and was taken in 2006 in Minnesota during a week-long gathering. One of my favorite activities is touring old houses. While on a trip to Duluth, MN with my sisters, I had the pleasure of touring the Glensheen Mansion. The house is absolutely beautiful and has an intriguing history (murder and suspense included). How I would have loved to spend more time there. If you go, I recommend taking the actual tour of the house, especially the top floor which is an extra charge but well worth it. 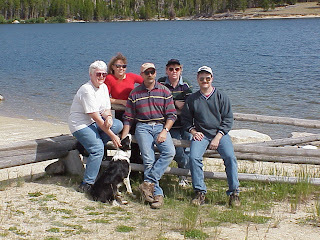 Nearly 10 years ago, the family gathered for a week-long camping trip. One branch of the family brought an RV and the rest tented. We cooked on an open campfire and connected with each other as adults. This photo of me with my nieces and nephews is one of my favorites from that gathering. The devotion Rowdie (the border collie) shows to his master (Dwight) is priceless. I'll be away for a few days for a routine medical appointment and a road trip. I've scheduled some posts on a variety of topics to fill-in until I return. I hope you enjoy them. Feel free to leave comments, as I will be checking email frequently. 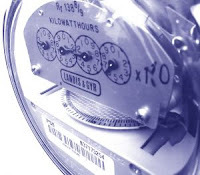 Last August, I replaced all the window sashes in my house, and I am pleased that my electric bill has been less each successive month, and the outside temperature has not varied significantly from the previous year. It has been a mild Spring so far with cooler temperatures. The true test of the windows will be in late July, August, and September, so I am curious to see what this summer's bill will show. So far, I am very pleased with the return on my investment. The main reason I don't like to cut fabric for quilts is that my "cutting table" (actually a folding, resin table) is just too low. I always get a backache that troubles me for days. I considered purchasing bed risers, but the cost to raise the table to the necessary height took my breath away. Since each riser is 3.5 inches, I would need a minimum of three risers for each table leg (a total of three sets of bed risers), and the cost would have been over $70 US. Yikes! Feasible? I don't think so. So, I limited the time I spent at the cutting table. I considered using cement blocks, but they would not offer enough height without stacking. I considered gallon-size cans, but they would be too short on their own. No solution came to mind. Then this week I discovered the solution. when one of the Stashbusters members posted on the group message board about using PVC table extenders. 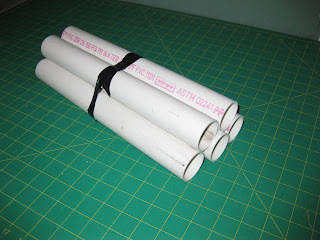 I knew this idea was worth pursuing because PVC pipe is durable, light-weight, and best of all, inexpensive. I purchased a length of pipe at Ace Hardware and had it cut in 13 inch sections, resulting in nine segments. The "extenders" were very inexpensive: $4.00 US for the pipe, averaging an incredible $ .44 for each extender. I slipped each table leg into a PVC segment, and now the table is a comfortable height. I am eager to see if this eliminates my backaches. If not, I am only out $4. 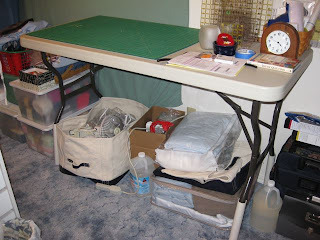 The bins to the left of the table are filled with yarn, and the bins under the table hold fabric and spare bedding. If the clutter bothers me, I may construct a table skirt out of a thrifted sheet. Bonus: I have five extenders left, enough for another table and a spare. A Stitch in Time. . .
Do Petunias Grow on Trees?